Govett’s Leap is one of the great places to visit in the Blue Mountains, outside of Sydney. It is a lovely waterfall that drops about 540 feet from the greenery on top of the plateau to the even denser greenery at its base. Govett’s Leap was named for William Romaine Govett, a surveyor who was the first European to come to this spot. The waterfall is in a splendid, World Heritage-listed area that is a popular place for bushwalking. Near the waterfall, there is a lookout that is famed for its glorious vistas out over valleys and the surrounding tree-covered plateau. 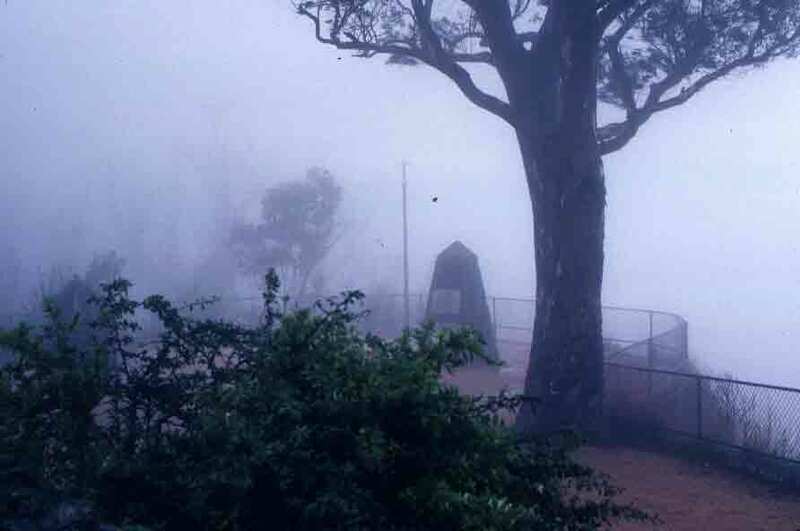 However, as is not entirely uncommon in coastal mountain situations, it can be given to bouts of fog. Hence, the “glorious vista” on the day I visited was pretty much like staring into a wall of cotton. However, I did get a photo of the historic market that tells us about the William Govett — but beyond that, a great nothingness. So I guess I’ll just have to go back someday! One of the many things that delighted me while at the Taronga Zoo — and, indeed, in several other parts of Sydney — was that the wild birds that showed up were occasionally as exotic as the things one was seeing in cages. In the suburbs and out in the surrounding mountains, I’d seen parrots, rosellas, and galahs, but the “city birds” of note included white cockatoos in the Botanic Garden and, anywhere there was food to be scavenged, Australian white ibises. 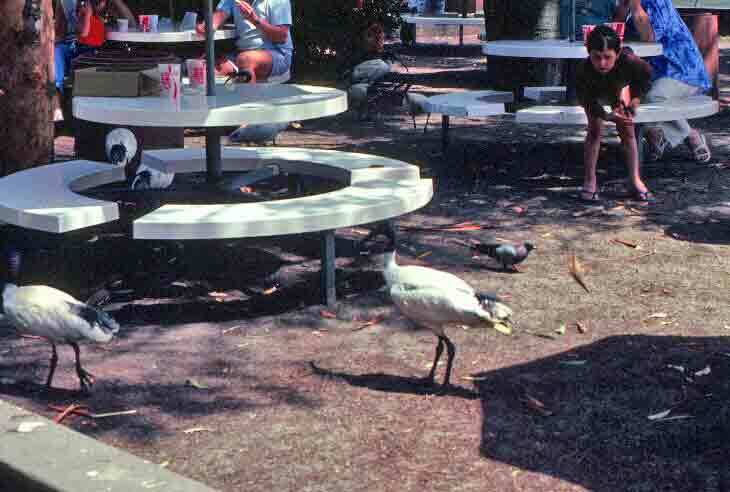 It amused me no end to see the ibises strolling amid the picnic tables at the zoo, perched on the edges of garbage cans, running down anything dropped by a careless child. Pigeons were on hand, as well, and a few seagulls, but most of those seeking handouts at the zoo were the ibises, which were also so building nests at the tops of some of the zoo’s palm trees. In Florida, large, exotic birds may be a common sight, but to a Chicagoan, it was a delightful surprise.